Fujitsu distributed by Crest Technologies, has unveiled its two new 2Mbit ferroelectric RAM (FRAM) chips, the industry's high capacity FRAMs, which are now in volume production. Fujitsu's MB85R2001 and MB85R2002 feature non-volatile memory with high-speed data writing, low power consumption and the ability to provide a large number of write cycles. 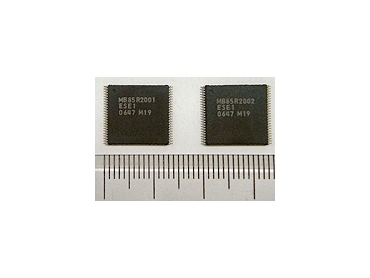 The MB85R2001 and MB85R2002 FRAM chips are ideal for automotive navigation systems, multifunction printers, measuring instruments and other advanced applications that can use non-volatile memory to store various parameters, record equipment operating conditions and preserve security information. The FRAM's high-speed data writing and large number of available write cycles allow its application in office equipment to store event counts or parameters and log every event. FRAMs allow 10 billion read/write cycles, which corresponds to writing 30 times a second continuously for 10 years. FRAMs can also store data for over 10 years without a battery. In applications such as instrumentation, the Fujitsu FRAM write mechanism ensures that data can be written to FRAM at high speed even if the power is interrupted even temporarily, so valuable data will not be lost. The configuration of MB85R2001 is 256K words x 8bits, while the configuration of MB85R2002 is 128K words x 16 bits. Both MB85R2001 and MB85R2002 feature read access times of 100ns and read/write cycle times of 150ns. The MB85R2001 and MB85R2002 operate from 3V to 3.6V. "These new FRAMs provide the increased functionality and higher memory capacity required in new automotive, instrumentation and other advanced designs," said Keith Horn, chief operating officer of Fujitsu Microelectronics America. "The new FRAMs also share the electrical characteristics of the 1Mbit FRAMs from Fujitsu, enabling an easy migration to the higher capacity versions with the added connection of only one address." The new 2Mbit FRAM products namely MB85R2001 and MB85R2002 have the same electrical characteristics and TSOP-48 package as Fujitsu's 1Mbit FRAM products (MB85R1001, MB85R1002) that are currently in production. With the additional connection of only one address, a shift to the 2Mbit MB85R2001 and MB85R2002 has been made possible. Hence, on the same PCB and depending on the necessary memory capacity, either the 1Mbit or 2Mbit FRAM can be used. The new MB85R2001 and MB85R2002 FRAMs are available in 48-pin TSOPs.